People on the remote island of St Helena have warned that unless Britain builds them an airport soon, their economy will collapse. Without it, children are becoming "economic orphans" as parents are forced to take jobs on other islands and the sick are travelling hundreds of miles by ship for specialist care, often without a nurse. 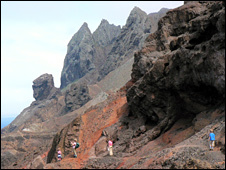 In May 1659, Captain John Dutton landed on St Helena, a speck of volcanic rubble more than a thousand miles off the African coast, and founded a British colony. He stepped ashore to the sound of trumpet and drum. In 2009, there was no fanfare to mark the 350th anniversary. Down at the castle that the captain built, the people who run St Helena had other things on their minds. A few months earlier, the UK government had frozen a project to build an airport on the island. In the depths of a global recession, it had second thoughts about spending more than £300m on a tiny island in the South Atlantic - for the time being. At meetings across the island, people spoke of feeling "disbelief, distrust and betrayal", according to a consultation report published by the government on Wednesday. In the capital, Jamestown, Vince Thompson read the report and referred back to the day Captain Dutton landed on the uninhabited island and claimed it for the Honourable East India Company. "After all those years the problems remain fundamentally the same," he said. The island, now a British overseas territory, is just as isolated now as it was in the East India days. Then, sailing ships were a regular sight in James Bay, stopping for fresh supplies on the long haul down to The Cape. Now the only regular visitor is the Royal Mail Ship St Helena, which brings nearly all the island's needs and a very small number of tourists. It also takes islanders, known as Saints, to jobs far away. With no airport, many find it hard to return. Often they go to Ascension Island or the Falklands - also British territories. Some employers, including the Ministry of Defence and the US Air Force, will not allow them to take their children with them. They are left behind, often with ageing relatives. About a quarter of Saint children are thought to be "economic orphans". Social workers have only recently been introduced to help deal with the severe problems caused by decades of families being parted. The island has four doctors at the old colonial hospital in Jamestown but Saints needing specialist care must travel to the UK or Cape Town - a week's voyage. A shortage of nurses means patients sometimes have to travel without one. For some, the ship comes too late and they die at sea. In 2005, the UK government announced that it would build an airport by 2010. One islander, quoted in the local newspaper, called it "the biggest thing since Napoleon", the French emperor who died on the island in 1821. The hope is that an airport will bring in enough tourists to give the island a viable economy and end decades of surviving on British aid, currently more than £20m a year. The island offers tourists a wealth of colonial heritage, with a backdrop of lush mountain greenery. Cannons still point out to sea from batteries all round the spectacularly rugged coastline. However, many islanders fear an airborne invasion of tourists would destroy the island's tranquillity and culture. Nearly a third questioned, including Saints overseas, said they wanted a faster shipping service instead. But nearly all agreed the island could not wait up to five more years for their ageing ship to be replaced. That, said one person, would be "suicide for the island". In the past decade, its population has shrunk by a fifth to only 4,000 because people cannot make a living at home. The average salary is £4,500 and food and fuel cost more than in the UK. Now there are not enough people of working age to run all its services, such as schools and the hospital. 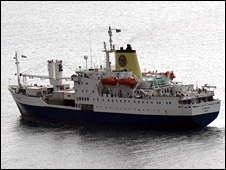 And every time the RMS St Helena sails out of James Bay, it takes more islanders away. Rosemary Stevenson, the report's author, said: "There is a strong sense that further delay would take the island to a point where recovery will no longer be possible." "We will consider carefully the views submitted in the consultation, taking into account the current economic conditions. "The global economic conditions are very different now from when we tendered the airport contract. We have a responsibility to re-examine matters when the circumstances have changed so significantly. The consultation provided an opportunity for anybody who is likely to be affected by the decision to make their views heard before the decision is made. "When we launched the consultation we made it clear that the government's commitment to ensure access to and from the island is not in question: we will not contemplate a reduced level of access to that currently provided by the RMS."